We realize that our NDC community no longer has the luxury of a campus bookstore or any way to find new NDC merchandise. We wanted to provide that opportunity for our friends and alumni so that they can continue to show their NDC pride! If you have never used Cafe Press before, here is a quick Q&A that may help with some of your initial questions. Q: What is Cafe Press? A: Cafe Press is an online store where an artist or group can upload their logo or design and have it placed on a variety of products. Those products are then able to be sold in an individual’s online store. Q: If I want to purchase an item from the store, how does this work? 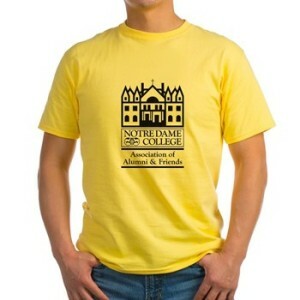 Q: Does the NDC Association of Alumni and Friends profit from this store? A: We make a small profit through the sale of each item that is sold in our online store. Cafe Press charges an initial cost per item, and store owners are then able to mark their items up in order to make a profit. We have added on a very low profit margin so that we can continue to support events such as reunion and scholarships, while making these items as affordable as we can. Q: Shipping seems expensive. Are there any tips for making this more affordable? A: Unfortunately, shipping tends to run high with many online market places. However, we have found that if you combine shipping for two or more items, the cost increases minimally. Just a tip in case you see more than one item that catches your eye!